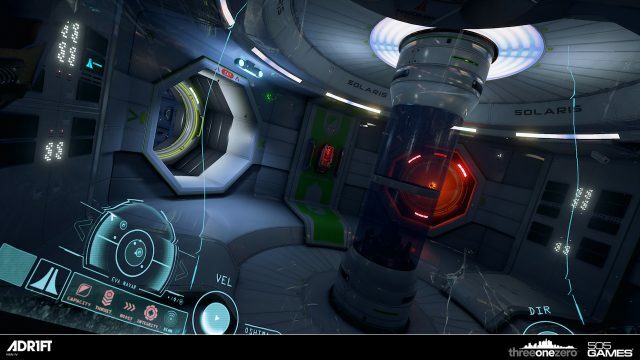 ADR1FT is gorgeous, but it just isn't enjoyable to play. It makes its narrative hard to access by making exploration difficult, and offers up repetitive frustration during its several hour campaign. Sometimes video games can be their own worst enemy. Few things are more frustrating than getting into a story, only for a game to throw up a proverbial brick wall and stop you from progressing. Nor is it enjoyable to sit through a 50 second load screen only for the game to crash. Sadly, that’s the case with ADR1FT – a title that I wanted to love yet found frustrated by at every turn. ADR1FT starts off in the wake of a tragedy. A space station has been destroyed, and almost all of its crew has gone down with it. The lone survivor is the ship’s captain, Alex Oshima. The player must guide her around the malfunctioning ship, fixing its systems so she can hopefully take an escape pod back to earth. Since the player is alone in space, there isn’t much to the game’s narrative at its onset. All of Alex’s shipmates are dead, and all they left behind were some audio logs which are scattered around the ship. Since the player has to go out of their way to get these floating containers, it’s easily possible to finish the game without having a clue about what happened on the ship, who was on it and why it malfunctioned. Making matters worse is that the player is constantly losing oxygen and only has a small amount to work with at any given time. This makes any exploration a risk. It simply doesn’t make sense for me to go out of my way to pick up an audio log when I’m trying to survive. This causes the narrative to become fragmented, optional, and not very compelling. The few that I was able to pick up painted a picture of an ambitious captain, shipmates dealing with personal demons in space, and the stress the isolation causes. It was all interesting, and I wish there was an easier way to take it all in. Since its narrative is optional and tough to experience, ADR1FT relies heavily on its gameplay. It initially makes a solid first impression, as it’s just plain cool getting to float around space. It’s a bit unwieldy at the start, as using the left stick to thrust in different directions and the bumpers to float up and down is unnatural, but I got used to the quirks after a bit. There’s a solid tutorial as well and I was quickly grabbing oxygen canisters in the air so I could last another 30 seconds without suffocating. Sadly, this floating is all there really is to the game. 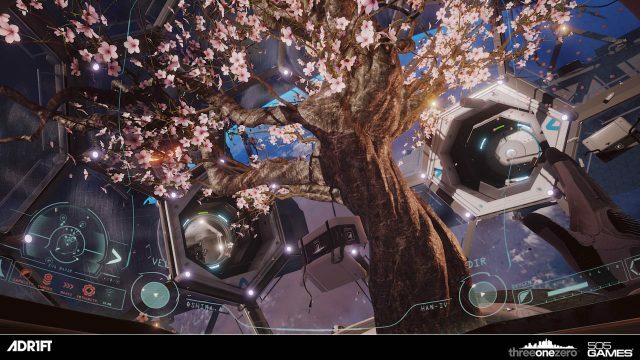 There are no puzzles to solve in ADR1FT, just floating around from one area to the next while looking for oxygen. It’s all one long fetch quest, as various systems need to be turned on. There’s a map on the bottom left-hand corner of the screen that is supposed to guide the player, but it’s one of the worst indicators I’ve ever seen in the game. It often led me to dead ends (quite literally when there wasn’t any oxygen about) and I spent several hours in space pointlessly gliding around since I had no clue where to go next. There isn’t a full map, just this miniature one in the corner and it’s needlessly frustrating. It’s baffling to me that the game’s HUD is this bad, as it kills the entire experience. The arrow on the map would routinely freak out if I needed to move in a vertical fashion (shockingly a 2D map doesn’t convey a 3D space well), and it would rapidly move from left to right on a whim. It’s a confusing system, which makes space become quite boring. Another huge issue with the game is how poorly it’s been designed from an accessibility standpoint. ADR1FT features some of the tiniest subtitles I’ve ever seen, and there was no way to read them while other action occurred in the game. If you have trouble hearing, then you won’t be able to get anything out of the story here, but that’ll probably be the case even if you aren’t impaired. The only thing that the game really has in its favor is that its depiction of outer space is absolutely gorgeous. Still, even this pro comes bearing issues. The framerate regularly would drop, and on occasion hitch up. Those weren’t the only glitches I encountered, though, as I also had the game crash all the way to the PS4’s dashboard more than five times. Not only is that ridiculous, it made me not want to play any more of it. 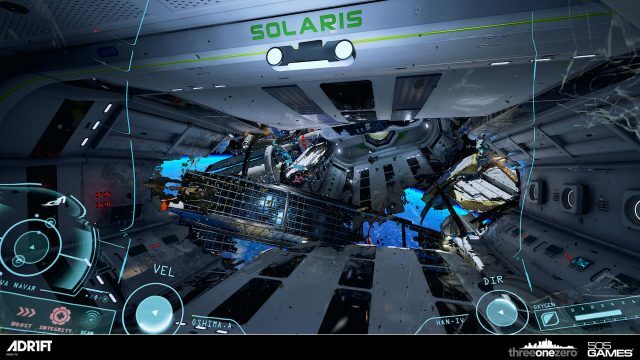 ADR1FT makes something as exciting as space exploration a complete bore. Every aspect of the game — from how it handles its narrative to its actual gameplay — is a disappointment. There are some good ideas here, but they never came together and consumers are left with a messy package filled with issues.